There is always a big debate over whether tracks justify their cost versus pneumatic tyres. Results from our extensive field trials and results have shown us that tracks can offer a very attractive return on investment. 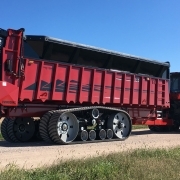 Through increases & improvements in operator efficiency, soil structure and reduced soil compaction there is a clear yield advantage to using tracks over tyres. 2.) TRACKS KEEP COMPACTION SHALLOW SO YOU CAN REPAIR IT IF YOU NEED TO! 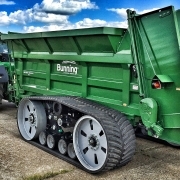 Studies have shown that in the case of combine harvesters, the compaction following a rubber track is in the top 150-170mm of soil profile, however in tyres this can be up to 600mm deep. As intensive cultivations are reducing worldwide and cultivation depth is generally reducing, it can mean that damage caused during harvest/crop transport with tyres is non-repairable and hence permanent long lasting damage can occur. 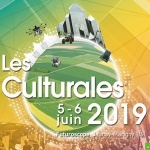 Cultivation depth versus power/fuel consumption is exponential, meaning that the cost of repairing to 600mm is extremely expensive /acre or hectare. axles, 6 tyres, 6 rims or 2 tracks + 1 axle. 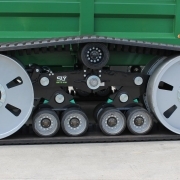 The investments we have made in manufacturing efficiencies mean we can offer tracks at affordable prices without sacrificing durability. Track technology has improved significantly in the last 10 years. and very low cost per hour. Rolling Resistance: Large diameter wheels + hydro-pneumatic tension. Maintenance: Oil filled hubs with clear view lenses, no grease points. Flexibility/Design: Unbraked, Braked, Power Assist. Sly Enduratrax: Up to 45% more guiding block surface, compression moulded guide blocks will not de-laminate from carcass. 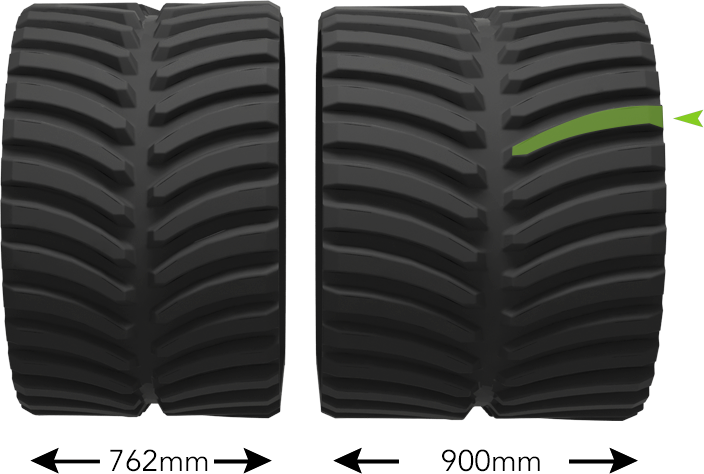 Up to 24% more contact area and tread height for longer wear in high roading applications. Aesthetics: Wheel scrapers and mud ejectors keep track wheels clean and maintain paint, an investment of this kind should not be rusty after the first season. Small idlers and spring tension. Square tread shape and square edged bars can give higher disturbance to the soil. 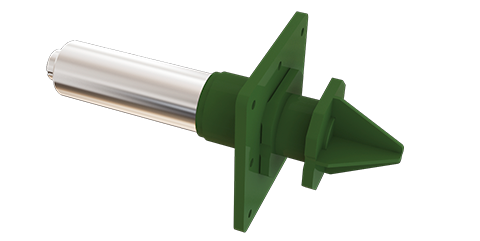 Non compression (extruded chamber cured) guiding blocks can delaminate from track carcass. Density of guiding blocks is low per metre of track. 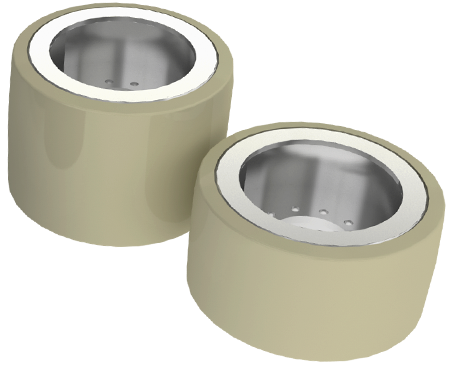 Formed wheels catch dirt and hold water causing rust and paint degradation very quickly. No options for wheel scrapers/ejectors. 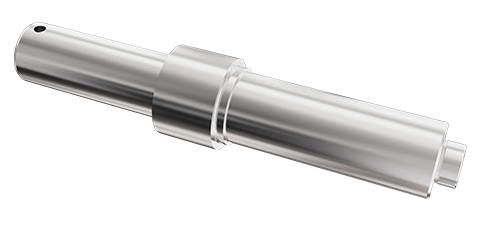 Larger wheel diameters for decreased rolling resistance. 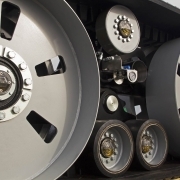 Steel Wheels Suitable for general use, not recommended for higher weight applications as increased internal track wear can occur. 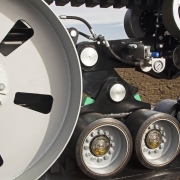 Rubber Wheels Suitable for the majority of applications, improved inner track life. 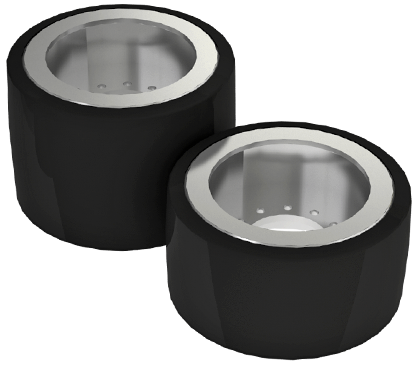 Polyurethane Wheels For extreme applications where high roading or high hour per year use in more abrasive oils/conditions. Curved smooth tread pattern does not disturb the soil. 400X80 Brakes – 762/900mm track. 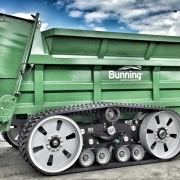 406X120 Braked – 900mm track. drum brakes for lightweight applications. 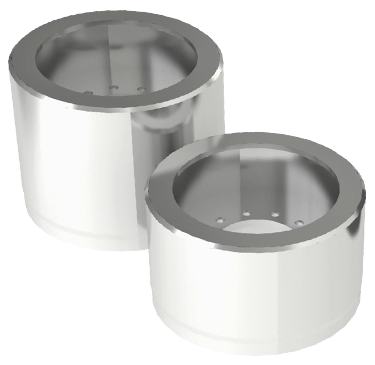 drum braked for heavyweight applications. We have two mounting options available. 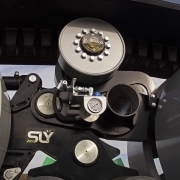 Sly can assist in integrating our stub axles into your chassis please contact us for more information. (used) trailers and also new trailers with OEM's.